Stepping into a new classroom is a nerve-wracking venture. When I entered my first classroom as a student teacher in Maryland, I was sweaty. I’d made piles of three-ringed binders to prepare. My 1200-page Literature textbook was stickered with Post-It Flags. I scanned the room. Audio CDs? Check. Encyclopedias and dictionaries? Check. Projector cart? Check. Everything was set, and I couldn’t wait to meet my students. A few months later, I found myself about to enter a completely different classroom–on the other side of the Atlantic Ocean. I’d missed the first day of school because of a four-day flight delay. When I finally arrived in The Gambia, Africa’s smallest mainland country, the airport’s electricity was off and it took several hours to get my baggage. Racing to the school in an overcrowded bus-taxi, I met my new principal. She handed me a one-page curriculum (in typewriter font) and a few pieces of chalk. Everything was set, and my students were already waiting for me. I greeted class after class of 50+ students–and realized maybe a quarter of them had a “textbook,” which looked more like a mini-collection of stories with review questions. It didn’t take long to find out that the majority of my tenth graders couldn’t read or write English fluently. And those who could would probably test at a fourth or fifth grade level. What was going on? After a couple of months, I realized: no one has books. Even the school’s “library,” which was grossly understocked was “off-limits” to students, for fear that books might go missing. My host family’s house was filled with children, but devoid of picture books. Thus, there was no bedtime story tradition. No libraries in my town, and no bookstores. After that teaching stint, I came to learn a statistic that there was only about one book for every 1,000 Gambians. And then I discovered something just as surprising–only in a good way. A twenty five year-old girl who lived in Minneapolis was starting a project to send a million books to Gambia to fight the “book famine,” as she called it. 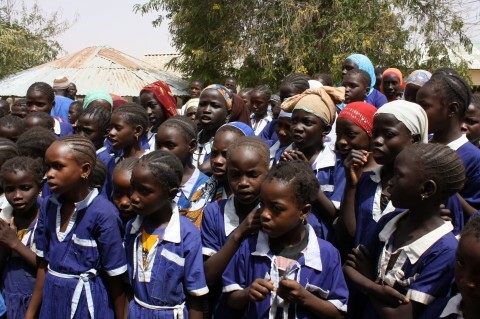 One Million Books for Gambia. I began collecting books and bucks from friends just after Megan Meyer, the young woman who thought up the project, built her first library in The Gambia. It was a 7,500-book medical library installed in a rural hospital. Seeing her project so well done inspired me even more. Since it only costs about fifty cents per book to get it to Gambia, and the official language is English, collecting books and bucks was easy–people could measure their results. 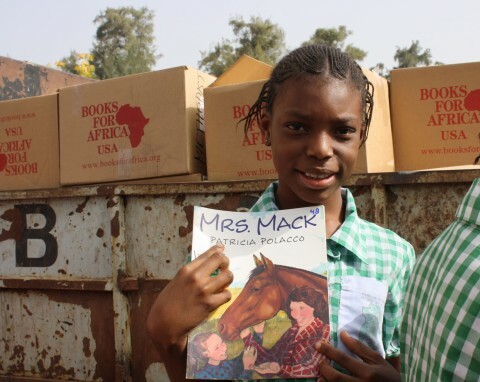 I booked some school visits and got kids involved in helping African kids by collecting books and bucks. And what I did was only a teeny-tiny part of the effort–because the effort attracted several corporate sponsors. The best part of my efforts thus far came in February and March of 2012. 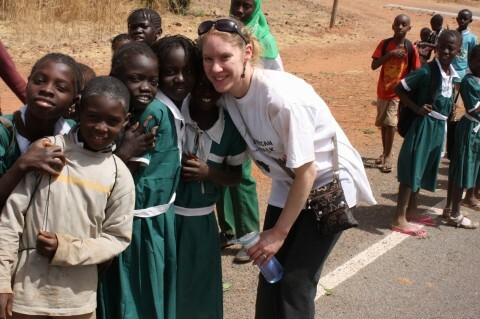 I got to travel with several of the sponsors and volunteers to Gambia. 44,000 books, 31 libraries, and thousands of smiles later I got back on a plane knowing we’d changed the ratio of books to people. And, we had about 950,000 books to go. But perhaps the most important thing I discovered through this phase of 1 Million Books for Gambia was that there are Gambian teachers and parents who are just as dedicated to literacy in their classrooms and households as I am in my own home. They told stories of rebuilding libraries four times after flooding rains. Shared dreams of their children being able to read, or maybe even write books one day. And left behind all their responsibilities to walk for two days from border to border, promoting literacy. I realize how rich my life experiences have been–and wonder what kind of person I’d have turned out to be if I hadn’t learned to read at age four, or hadn’t grown up with a mother who took me to my city’s free library every week. As a result, I think about money in a different way now. Since discovering 1 Million Books for Gambia, I measure money in books. And books built literacy. Which equals opportunity. Fifty cents sends one book, one opportunity. Fifty dollars supplies a classroom, fifty opportunities. Five hundred fills a library. And libraries fill the future with opportunities. You can read a lot more of my story here. But my story’s never finished. I hope you’ll join me and be a part of it. 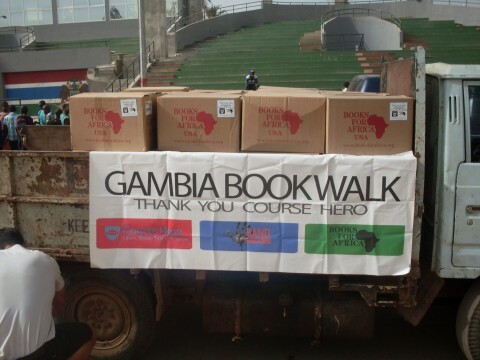 If you’d like more information on how to donate books or bucks to 1 Million Books for Gambia, please visit BooksForAfrica.org and click “Donate To A Project” to locate this project in The Gambia. 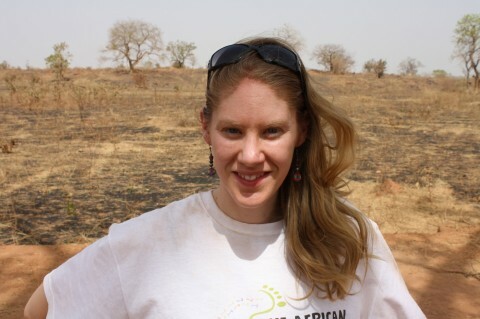 You can also lear more about Megan Meyer and her health and literacy organization at www.HandinHealth.org. 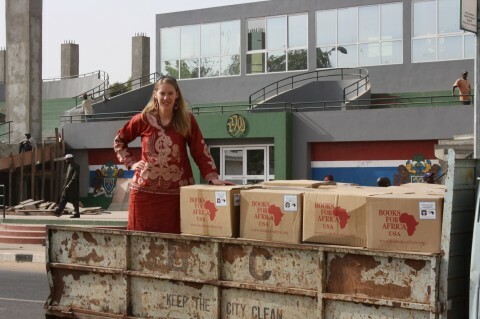 Thankyou Miranda very much for an insightful look at your Project of 1 Million Books for Gambia….. mmm interesting friend she made to. This entry was posted in 12x12in12, Children's literature, Folklore / multicultural and tagged Gambia, Miranda Paul. Bookmark the permalink. What a fantastic and inspiring project! So great that you’ve been able to do so much already! Thanks, Susanna. I feel blessed to have ever been called to work in this country in the first place and it’s so rewarding to give back. Here,here Susanna, Miranda is inspiration! Thanks for posting. Wow! Erick, now theres an offer….how cool! thanks for commenting. 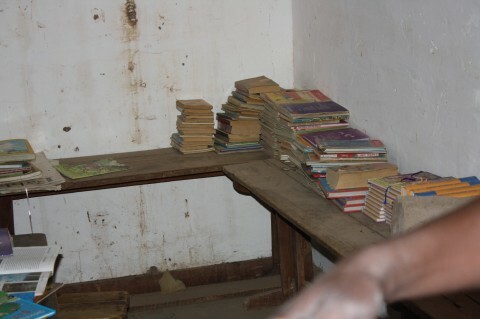 Excellent insights into the desperate need for books in the Gambia. Thank you, Miranda, and thanks Diane for hosting Miranda on your blog. Thanks for the note, Beth. It is staggering to me, even though I’ve traveled to Gambia five times now, the difference in terms of school resources. Thankyou Beth, it was a real pleasure having Miranda here again. I am so grateful she agreed to come back. I loved hearing more about this project, Miranda. While there was no bedtime book reading tradition, was there an oral story telling tradition amongst the families you got to know? Joanna- there was an oral storytelling tradition amongst some of the parents of children, but many of them have told me that other than on very special occasions, storytelling under the tree doesn’t happen much anymore. That’s what prompted me to begin working with several oral historians and folk tale authors in The Gambia because many stories are in danger of being lost now. I spoke a little about it in an interview on Sylvia L. Ramsey’s blog last year. Interesting, Miranda, it seems traditions are changing throughout the world! I will check out your post on Sylvia’s blog. Thanks! This is wonderful, Miranda! I’m sure your life will be richer for it…and you will add so much richness for the kids in Gambia. Thanks, Miranda and Diane for an inspiring post. Thank you, Penny, for reading my story. Sometimes I really find it hard to tell people about stories from Gambia because there’s so many other things to explain, contextual notes, etc. I get really wordy sometimes trying to transpose a world I’ve come to know so well, but is quite different in many ways. Thankyou Penny for your lovely comment. That is absolutely amazing, what a worthwhile project. Very inspiring indeed. Thanks, Catherine! I am glad to pass on inspiration as this project has been very inspirational for me as a writer and an educator. Thankyou Katie for commenting, Miranda certainly is inspirational. You are welcome. I can only imagine how wonderful it must have felt to deliver those books. Congratulations for not just recognizing a problem but taking ACTION on it. You are an inspiration. Julie – yes! It felt amazing. The best part was watching kids run and find a shady spot and opening up the books for the first time. Your reply here Miranda reminds me of what it is like for the children of Laos who on receiving their first book are not sure how it works and have to be shown how to open it and not start reading from the publishers copywrite page. It must be amazing to be there and see for yourself. Knowing you have been able to help in some way. Thanks Julie for your lovely comment. Diane, thank you for bringing Miranda back. Miranda you’re accomplishing so much. 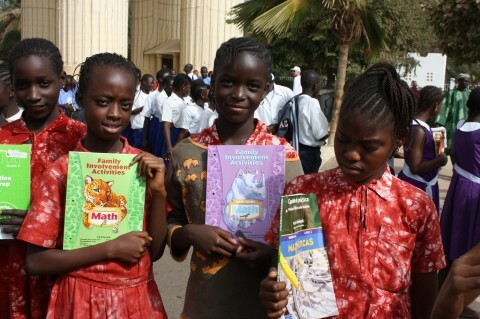 Is your effort Million Books for Gambia the same as The Books for Africa program in Georigia — didn’t quite understand. Do you prefer books sent to MN or GA? And, do you prefer money over books, or both? You are really making a difference in so many lives. Good for you! Thanks for sharing! Hi Patricia! Great Questions. 1 Million Books for Africa is a project sponsored by Books for Africa (yes, they have their main warehouse now in Smyrna, GA). Send books to GA if you can, that’s where they get on the boat. But as I live close to the MN warehouse, I drop them off there. We’ve got a wonderful overwhelming response to book donations, so right now we’re trying to catch up on money donations. But most schools I go to do both. We do “book and a buck” drives, which are great! “Book and a buck” – great idea! Thanks , that will help. Like the “book and a buck” idea. How would they feel about donations of books that celebrated differences and special needs? Should have asked that before. Thankyou to Pat for your lovely comment. It was a pleasure having Miranda here again. Thanks Joanna for your comments. I had such fun looking through all her photos. There were some of the small wildlife around her also. Thought of you! Very inspiring to learn more about your trip and how it all started! Thanks for sharing, Miranda and Diane! Your very welcome Tina, glad you enjoyed this. It was lovely having Miranda back and such insightful story. Nice summary of a great trip and program. It was a pleasure to meet you in person. 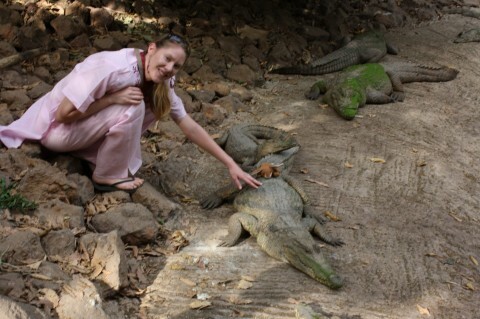 You and Megan are both doing amazing work in Gambia. Thankyou Stuart for your comment, I will let Miranda know you were here. My wife is from Kololi Gambia and both our children were born there…We live in Berkeley California and had the idea to start a childrens library in Kololi. So we gathered up some books and are planning to ship them soon. Our idea is to hire an unemployed teacher as the librarian, rent a small store front, and be open after school and weekends. At first we dont want to check out books, just let kids read in the space. After all that planning and ideas just on our own, i just now decided, hey, i should google CHILDRENS LIBRARY GAMBIA and i found this rich treasure trove of people YOU doing libraries in Gambia! Wow how wonderful! So, we need to connect…we are planning to be there in December through Jan to visit our family and set up the library…how can we connect and collaborate and work together? How we can we support the work whilst we are there?